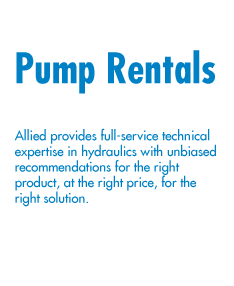 We offer a variety of hydraulic pump rental options. Our submersible pumps can handle large solids. 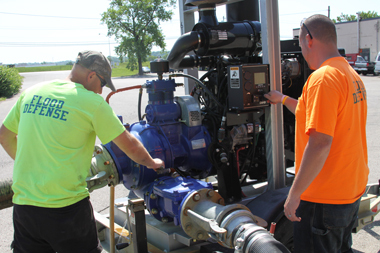 They are the same pump ends as our standard self-priming trash pumps, meaning that they perform with the same superior performance that you are used to with our pumps. The hydraulic power pack makes them ideal for projects that are too deep for self-priming pumps. Lake Dewatering: Rather than running an extensive amount of suction hose off of the pump, put the submersible dewatering pump itself out in the water. Deep Sewer Bypasses: The vertical lift of self-priming pumps is limited, but our capacity to bypass deep sewers is not. Indoor Applications: Diesel-driven pumps cannot be run inside most buildings because of exhaust issues. But with a hydraulic submersible pump, leave the power pack outside while the pump does the job inside. Easy! Cleaning Out Digesters: There is probably no tougher job for a pump than cleaning out a digester at a treatment plant. But our hydraulic submersible pumps are perfect for the job, making a tough job a little bit easier.